I've started a nano saltwater tank, specifically a Biocube 16 gallon. This is my first tank and after lots of research I decided to make the plunge. I found lots of information about the Biocube 14, but not much on the 16 gallon with the LED lighting. It is because of this that I've decided to document my journey so that other's can learn from my experiences. I chose this tank because of size restrictions where it's going and the ability to program a lighting schedule out of the box. Tank Modifiations: Removed the false bottom in chamber #1 to allow space for the heater (Details), Added Refugium into chamber #2 (Details), added ITC-308 temperature controller for heater, removed tab between chamber 1 & 2 to increase flow (Details). Plans for the tank: The long term goals for the tank is to have a mixed reef with 3 fish and a mix of inverts. I'm nine-ish months ahead of you with a Biocube 16. Will be following and hopefully can help along the way. I saw your build thread. It's one of the few that I found for this tank. I will be watching to see how your corals do. Which chamber did you add your heater to? Mine is currently sitting in the middle chamber due to the false bottom on the right chamber making it very shallow. Love the scape, lots of potential there. Thanks, it took a few attempts before I liked it. I originally ordered 25 lbs. of rock because I wanted to have options to aquascape with. Unfortunately they sent me 1 big 20 lb. rock and a few small ones. After trying a couple of setups, I eventually broke out a hammer and a chisel to make some flat spots for corals and swim-thrus. Originally I tried to hide it and put it in middle chamber and removed the insert/bioballs but could not guarantee full immersion 24/7 - some suggest cutting a hole in the bottom of the inlet chamber but was highly hesitant to do so. As a result the heater is tucked in back left corner of the tank by the return pump. I went for a heater with twist-top temp setting so it's a little longer than your average one. I also put a small aquarium thermometer in the front right corner to ensure I know the water temp. I could probably find a smaller shorter thermometer that I could bury in the back but I also like the comfort of being able to see the red light lit knowing the heater is working and doing its job. 1. Don't waste your time on SPS besides a montipora - mine is holding steady but not exactly flourishing. 2. My water changes for coral only were much smaller/less frequent than what I do now for fish - fish create ALOT more waste. Error on the side of bigger/more frequent water changes once you add fish. 3. Use drip-water acclimation, lights off, most conservative process possible when you add your fish. Ideally perform a quality water change and ensure your parameters are spot-on, otherwise you are most likely wasting money. 5. 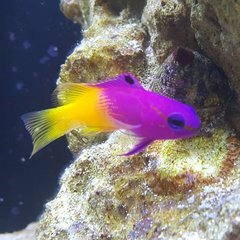 If you are really particular about what goes in your take, make sure you closely examine your purchases and dip/treat your coral to kill any critters. I've picked up bubble algae, little slugs, little snails, starfish, etc. Everything you introduce into your ecosystem has consequences. Ping me if you have any questions. Not an expert but I've learned a bit. 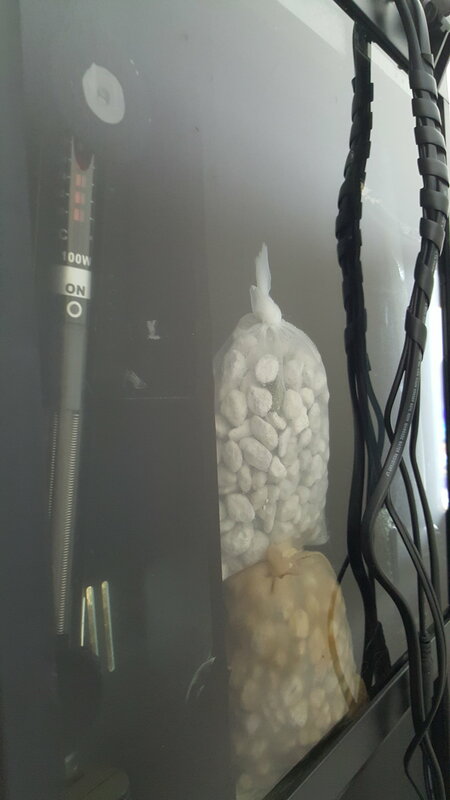 After searching for a solution to keeping my heater hidden in chamber #1 I found many threads about removing the false floor for the 14 gallon biocube. However, I couldn't find any information on whether this was the same process on the 16 gallon model. After messing with it today I can confirm that the false floor is removable on the 16 gallon. It is different from what I read on the 14 gallon which is siliconed in. To remove the false floor I first had to remove the 2 brackets located on the left and right side of the chamber. These are the brackets that hold the stock filter pad. I don't plan on using this filter so removing them was ok with me. They came out by prying them away from the sides with a flat head screwdriver. They came out pretty easy except for a small corner that was sealed in. The corner broke off with slight force and the pieces were removed. Once they were out the false floor simply lifted straight up and out. There was no silicone holding the floor in, it just rested between the brackets above and notches below it. Now that the floor is gone this chamber will be easy to clean out and my heater fits comfortably. As a bonus having my heater out of the way I now have added the other 1/2 litre of Matrix to the 2nd chamber boosting the total up to a full litre now so the biological filtration should be much more than needed. Tested for ammonia today just to confirm that it is present. Will start testing every few days now to monitor the cycle. Also added a picture of the back chamber with the false floor removed. Nice - what sort of material do you have up top? I've found depending on what kind of "floss" you put in there as it collects gunk and air pocket can form (think like the air vent being closed on a gas can) and slow your water flow into this chamber. Just be aware. I'm probably going to open up the holes with a drill to facilitate better flow. Opening that chamber might have an additional benefits to add chaeto algae? Get a small light on a timer and put next to glass for some photosynthesis? Since I don't use the stock filters either I might follow your lead - good stuff. I haven't had a filter up top so far because I figured with the tank empty it wasn't needed yet. I did notice some small particles floating today so I added a poly filter to the tray that sits on top of chamber 2. Currently chamber 1 is empty except the heater (may add the Chemipure here after livestock are in) . I'll watch it to see if there are any flow issues with the poly in. The chamber being open does give options to expand with: protein skimmer, chaeto, media reactor, algae scrubber, etc. I currently don't have any plans for these but it's nice to know that the flexibility is there if needed. Get a yard of it for $5.00 and it will last you a long time. I've found it collects particles very well and you can tell by the discoloration when it needs to be swapped out. What kind of corals are you interested in? And what is your budget? Currently I'm trying to keep the budget small so will end up getting small frags when I add them. 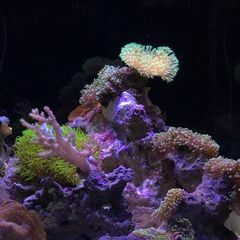 I'm sure things will change when I look at them in person, but currently I like the look of Rhicordeas, Zoas, Acans, Frogspawn, Hammers, Duncan's, leathers, and Gorgonians. Pretty much anything with nice colors or lots of movement. Sounds good - just gauging if you wanted to try SPS or not. I've set up my lighting schedule to initially run as follows. This gives me 8 hours of main lights which hopefully will help with algae on a new tank. The sunrise will start 30 min before the main lights come on and sunset will run for 30 min after the main lights go off. Blue lights will run early in the morning and late at night for viewing. All lights out from midnight until 7 am. I will monitor to see how these work out and adjust as needed. That rockscape is really aggressive. I like it! Thank you. I look forward to covering it with corals. Those time settings are about what I have. Did we discuss your CUC? Do you have ample room to clean glass or vacuum gravel? Have you confirmed the capability of your heater if it gets cold? Hot? Much easier to figure now vs. later. For the cleanup crew I'll probably add around 8 snails (mixed), 2 scarlet hermits, 1 emerald crab, and a cleaner shrimp. The heater functions and keeps the tank at 78 degrees. I have had a thermometer in it to monitor during the cycle. However, I'm planning on picking up a temperature controller to maintain it. Probably going to use this one (Temperature controller), but I'll seal the probe with silicon. I already have one of these that I've been using on a chest freezer for a couple years. It works well and is cheap. I wish I had a few more Astrea snails to help clean glass. Urchins are machines but they will plow your corals. Would recommend avoiding. Ammonia and nitrites have now both dropped to zero. I'll do a large water change tomorrow to reduce nitrates. There is minimal algae growth so far, not enough to keep a full clean up crew yet. After staring at an empty tank for a month, even something as small as little green algae dots are exciting to see. I'll probably end up starting with a small fish and adding the cleanup crew as needed later. Also I've sourced a cheap 6500k led light that I plan on using to create a diy refugium in chamber 2. More to come on that later once I have it running. I went CUC first and some small hardy corals. Something active like a shrimp/goby pair might be cool also. Blue leg hermits are pretty active critters. Wouldn't recommend emerald crab unless you have bubble algae issues. Established CUC will help establish the waste processing cycle from your eventual fish and reduce bioload, hopefully serving to reduce stress on fish as it acclimates. If you want to get hermits I would say don'y put more than like 2 in your tank size, as for the emerald crab mine was the first livestock I bought for my tank and she's been a model citizen so far but that's because my live rock has lots of different macros on it for her to munch on. If you're going to order CUC online I %100 recommend reef cleaners. Also, I'm kind of curious as to what kind of fish you're thinking about stocking. Also, I'm kind of curious as to what kind of fish you're thinking about stocking. Probably a royal gramma and a pair of clowns. I lost my first pair of clowns while trying to acclimate. Was really bummed. Just make sure your water parameters are good to go to give them the best chance to not get stressed. I do have a drip line for acclimating, and am planning 2.5 gal a week for water changes to help keep things stable. Yep I did the same. Would suggest following the most conservative procedures possible. Heat, no light, drip, etc. Check your LFS temp and match. If you check my CUC list I found the number I have to be very well balanced for our tank size. Snails are sensitive to nitrates so cheap(er) indicator of parameter issues than $20 fish dying. I'm interested in hearing about your fuge plan. I'd like to add some chaeto.